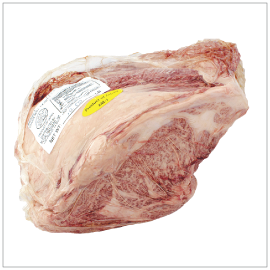 Chuck Roll is a long subprimal cut from the back of the neck up to the fifth rib known for its deep beefy flavors. 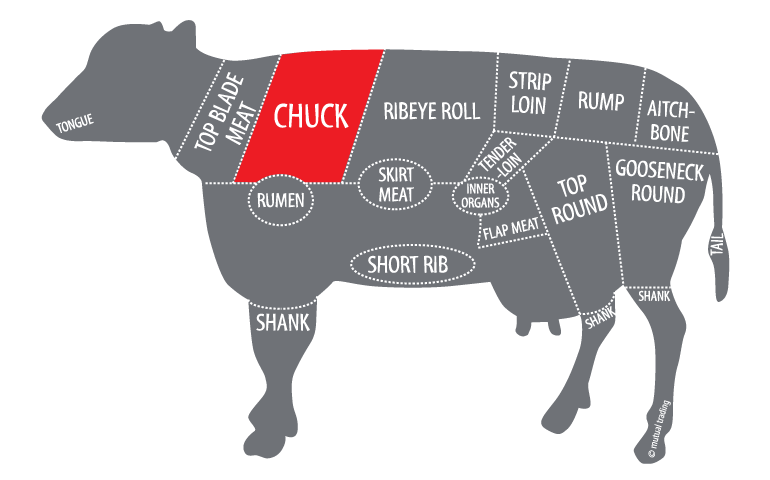 Chuck cuts are traditionally stewed or braised to break down the muscle fibers as they are rather tough and sinewy. However, chuck roll has a hidden gem—few inches of similar muscle as ribeye which is excellent for steak, shabu shabu or yakiniku. This A5 Chuck Roll has been divided into smaller sections bringing only the cut near the rib. The outstanding marbling of the Wagyu cattle makes this chuck roll cut amazingly tender and flavorful while still keeping it reasonably priced at nearly 20% less than the cost of ribeye or striploin.